Miami’s next loss will be its last of 2017-18. 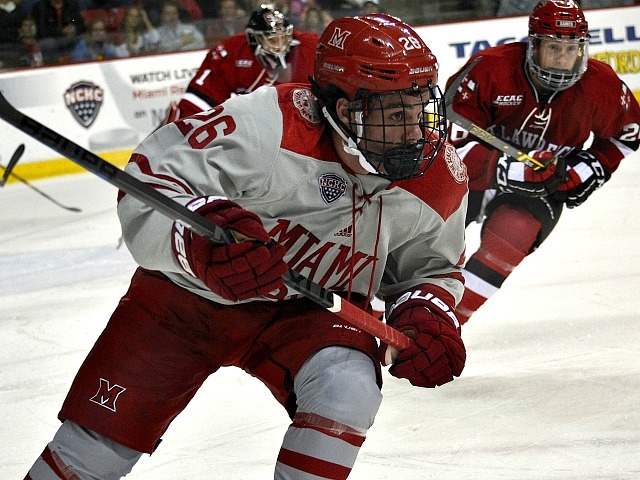 The RedHawks fell, 5-2 to No. 1 St. 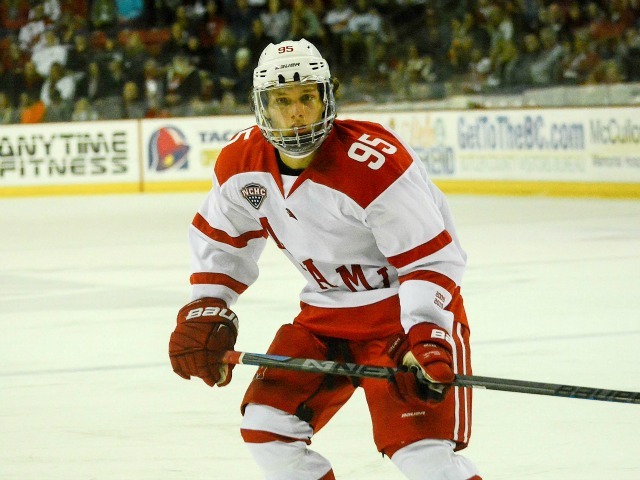 Cloud State in the opener of their best-of-3, first-round NCHC Tournament series at the Herb Brooks Center on Friday. 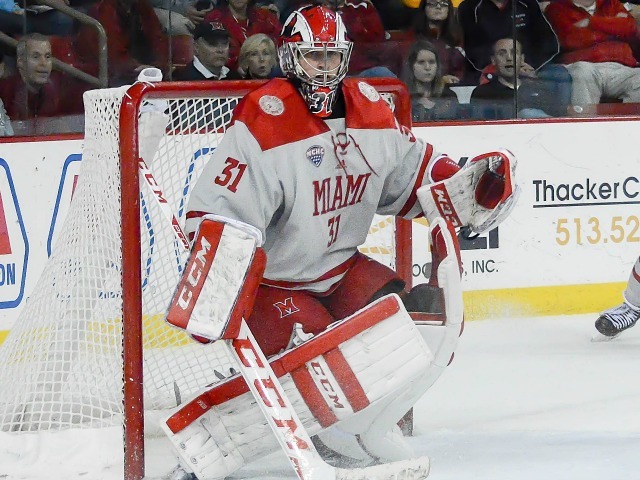 Miami needs to win out in the conference tournament to advance to the NCAAs. The loss extended the RedHawks’ winless streak to four games, and they are 1-7-2 in their last 10 and 2-11-3 since Jan. 6. It was Miami’s seventh straight defeat in this building. Game 2 is at 8:05 p.m. on Saturday, and if necessary, Game 3 would be played at 8:05 p.m. on Sunday. 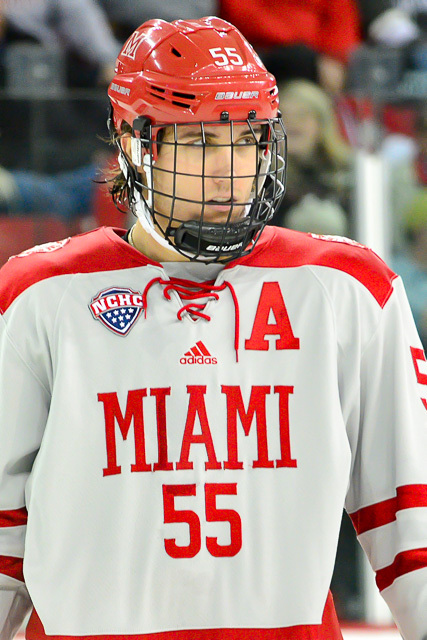 RECAP: St. Cloud’s Jake Ahcan fired a slap shot past Miami goalie Ryan Larkin on the glove side after taking a feed from Blake Winiecki on a rush just 6:02 into the game. 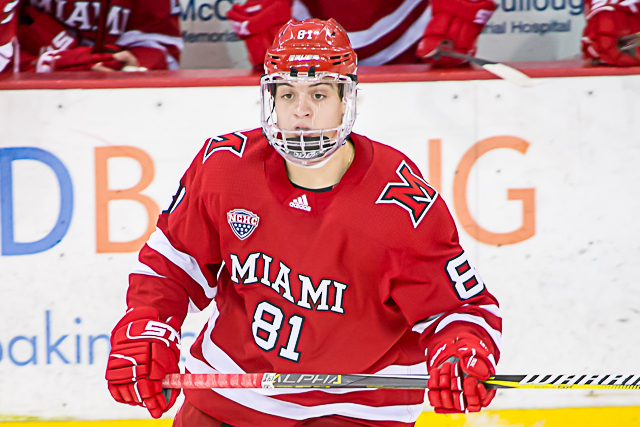 The RedHawks tied it with 4:32 left in the first period, as Grant Hutton sent a pass all the way across the ice through traffic to the tape of Kiefer Sherwood, who buried a wrister. Jimmy Schuldt put St. Cloud State back ahead, 2-1 on a stick side slap shot from the top of the faceoff circle on the power play 6:11 into the second period. Blake Lizotte gave the Huskies a two-goal lead with 4:56 remaining in the middle stanza when he intercepted a clearing pass along the board, skated in and beat Larkin 1-on-1. Sherwood beat two defenders down the right side to create a 2-on-1 and centered one to Gordie Green, who made a move and slid it in, cutting the deficit to one with 15:34 to play. 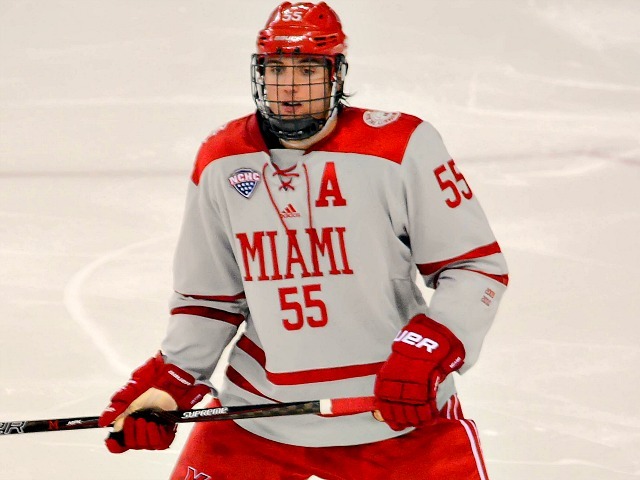 But Robby Jackson dropped a pass to Easton Brodzinski, who whipped it past Larkin on the glove side with 8:21 remaining and Mikey Eyssimont sealed it with an empty netter. 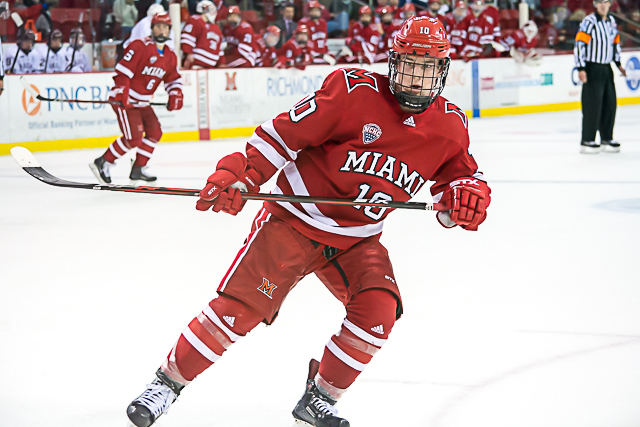 STATS: Sherwood led Miami with two points on a goal and a helper. He has points in a team-best five straight games, with three goals and four assists in that span. 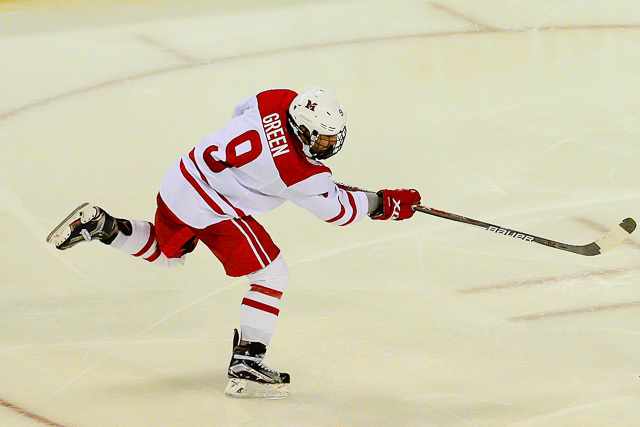 Green scored in his second consecutive contest and leads the RedHawks with 15 goals and 32 points. Louie Belpedio picked up an assist and tied Matthew Caito for eighth on the team’s all-time defenseman points leaderboard. The RedHawks’ last win in this building was in the 2013-14 NCHC Tournament when they swept the Huskies. Miami was also a No. 8 seed that season, and St. Cloud State was the top seed. 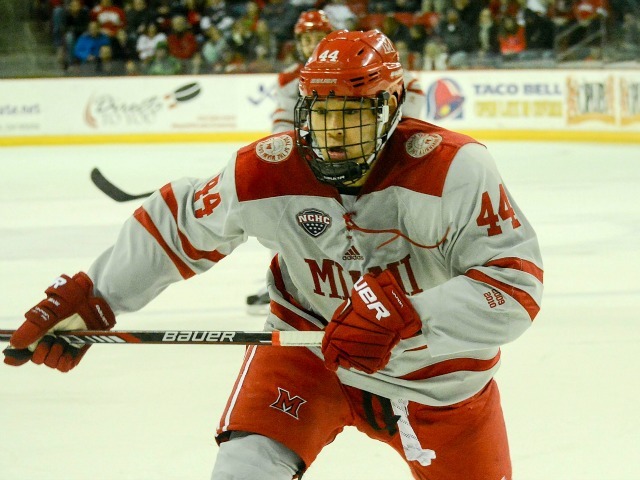 Special teams have been anything but for the RedHawks. They allowed a power play goal for the fifth straight game and are just 14-for-20 on the PK their last five games (70.0 percent). 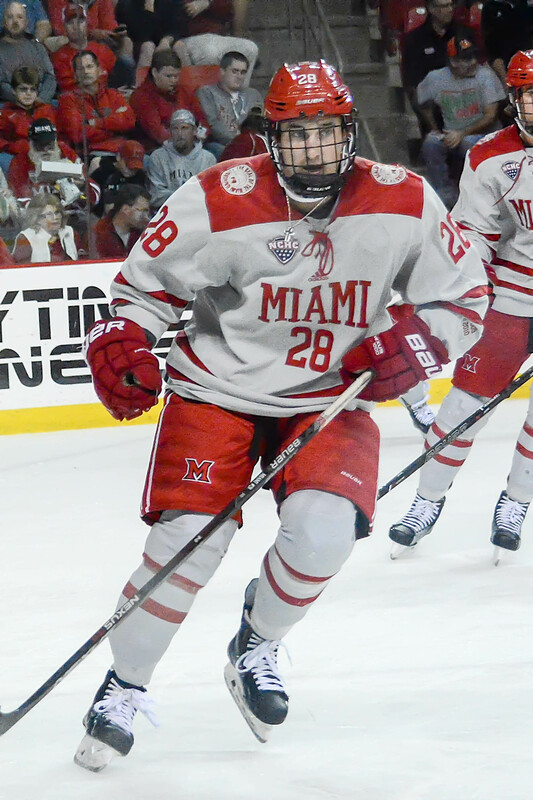 On the man advantage, Miami has just one goal its past 10 games, converting on 1 of 27 chances (3.7 percent). THOUGHTS: We saw a lot of repeating themes in the St. Cloud goals. Miami losing 50-50 battles, trailers jumping in on the rush uncontested and stoppable shots to the glove side getting by Larkin. A tough road to the NCAA Tournament just got a lot tougher for the RedHawks, who need to win the final two here and run the table in the conference semifinal and title game. Sherwood played some of his best hockey in this one, highlighted by his Jimmy Mullin-like acceleration past two defenders along the right wing boards for a 2-on-1 and goal by Green. LINEUP CHANGES: Miami went with the same 19 it dressed in the final game of the regular season. 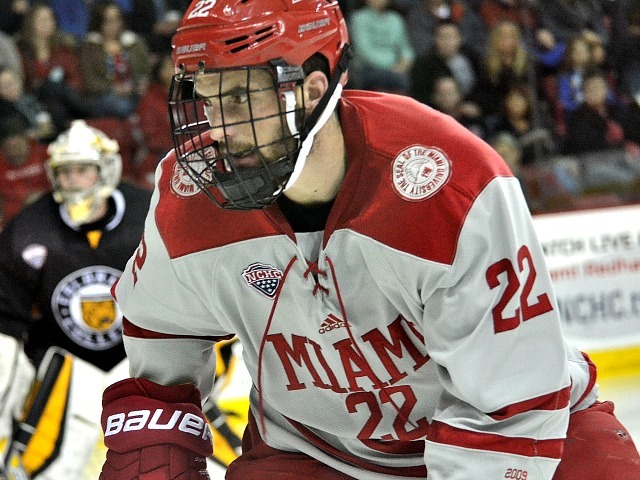 FINAL THOUGHTS: The RedHawks must win tomorrow to extend their season. One positive stat: Miami is still 2-1 in St. Cloud in the NCHC Tournament.